Place sausage in a skillet and add water to a depth of about 1/2 inch. Place over medium heat. Bring to a boil, occasionally turning sausages. After water has completely evaporated, continue cooking to brown sausages, turning as they brown. Once completely brown, remove to a plate lined with paper towels to drain excess grease. When slightly cooled, slice. Meanwhile, in a 6-quart pot heat oil. Add garlic, cook until brown then discard. Add sliced onions and peppers; cook 2 minutes, stirring. Stir in basil, salt, and peppers. Reduce heat to medium; cover; cook, stirring occasionally, about 10 minutes or until vegetables are soft. Stir in sliced sausage. If preparing ahead, reheat in oven at about 350 degrees F.
Save time by cooking sausages and vegetables simultaneously in separate pots. A double batch takes 1 hour and 15 minutes. 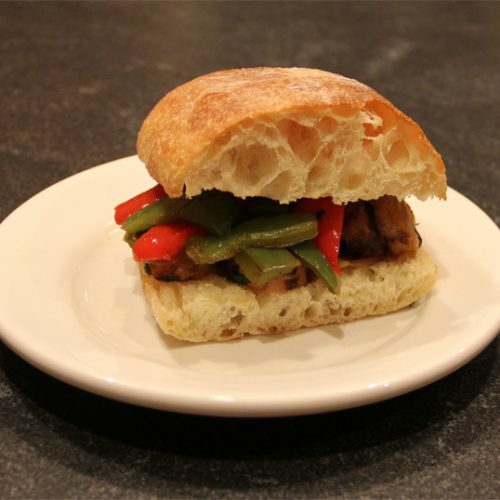 Serve with rolls or Italian bread for a sandwich.